You will get the additional 2,000 points when you hit your Golfy through those rings! When your total points is over 8,000, Woodpecker Golfy will be on the roulette! The winner's prize is Orichalcum Golf Club Set. All-birdie prize is 1 Glider. Have you heard about Schumacher Golfy before? 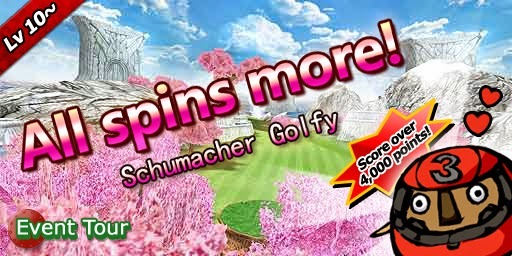 Get 4,000+ points, then Schumacher Golfy will be on the roulette! All-birdie prize is 1 Tail Wind Ball.